As a member of the family Apiaciae, the parsnip counts among its close cousins the carrot, parsley, dill, fennel, cilantro, and celery. All of these bear tall umbels of flowers, but like the carrot, parsnip is biennial, and will not bloom or set seed until its second year of growth. Also like the carrot, the parsnip is grown for its substantial taproot, which is always served cooked. Another member of this family, the cow parsnip (Heracleum maximum), grows wild across North America, and is considered a noxious weed. In several areas in North America, cultivated parsnips have become weeds, considered the same species, but with some undesirable traits. 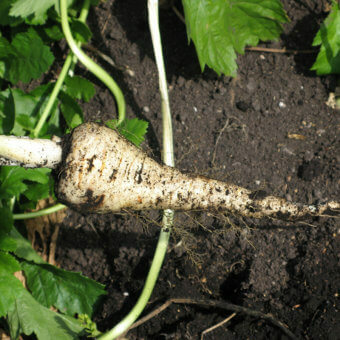 Wild and cultivated parsnips will cross-pollinate. Parsnips are native to Eurasia and appear to have been cultivated there since ancient times. 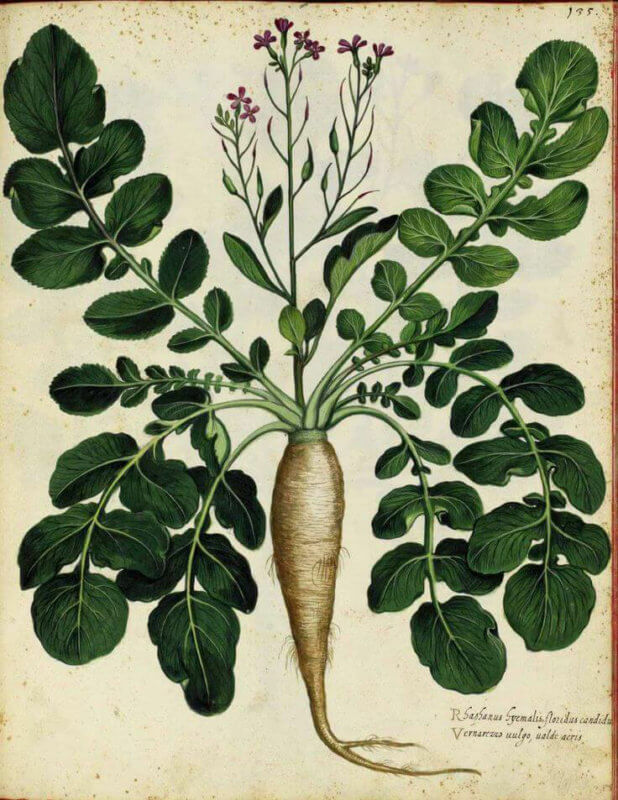 Tracking down an exact lineage is difficult due to the fact that both the carrot and parsnip were referred to as pastinaca in Greek and Roman literature. Until 1536, when the potato was first introduced to Europe, parsnip was the preeminent root vegetable, along with the turnip. It’s worth mentioning that the Romans believed, somewhat optimistically, that the lowly parsnip was an aphrodisiac. The garden Parsnip nourishes much, and is good and wholesome nourishment, but a little windy, whereby it is thought to procure bodily lust; but it fastens the body much, if much need. It is conducible to the stomach and reins, and provokes urine. Growing parsnips calls for patience, as the seeds are slow to germinate, and the plants need a great deal of time to mature properly. Because of this, they are sometimes grown alongside two similar root vegetables, salsify (Tragopogon porrifolius) to which parsnips are related, and scorzonera (Scorzonera hispanica), which is actually a type of Aster, and not related at all. These three plants all have long, narrow, edible taproots, and all take a full season to develop. Despite having to sacrifice precious space in the garden for a whole season, the gardener who grows these vegetables is compensated by their very good keeping quality, both in the ground and the cold cellar. Difficulty: Easy. Parsnips will do much better in the ground, so are not suited to containers. Timing: Plant from late March to mid-July in a deeply dug bed. Most sources recommend direct sowing as soon as the ground is workable in the spring. A longer season results in a longer, thicker root. Sowing: Seeds can take 3 weeks to germinate and will not push through crusted soil. Cover seeds with compost or put floating row cover over planting to shade the soil and conserve moisture. Sow 1cm (½”) deep, 1-2cm (½ -1”) apart. Soil: Prepare the bed as you would for carrots. For even longer parsnips, you can dig or form holes 60cm (24”) deep by jamming a crowbar or similar tool into the soil and working it back and forth. Growing: Thin to 8cm (3”) apart once plants are established. Weed carefully and keep watered. Aim to provide a constant, moderate supply of moisture and nutrients for a steady, slow growing period. A pH range of 6.0 to 8.0 works best for parsnips — as well as salsify and scorzonera. Harvest: Flavour is best after a couple of good frosts. Dig parsnips from October 1st through the winter as needed. Protect from freezing in the soil with thick straw mulch if it is a cold winter. Parsnips keep better in well-drained soil. The average family will be supplied by a 6m (20’) row. Storage: Store in the ground until use. Parsnips will last 4-6 months if stored in sawdust, leaves, or sand between (32-40F) at around 90% humidity. Pests & Disease: Carrot rust fly maggots injure the roots of parsnips. Use lightweight row cover to prevent insects from settling and laying eggs. Practice crop rotation. About Companion Planting with Umbelifers.